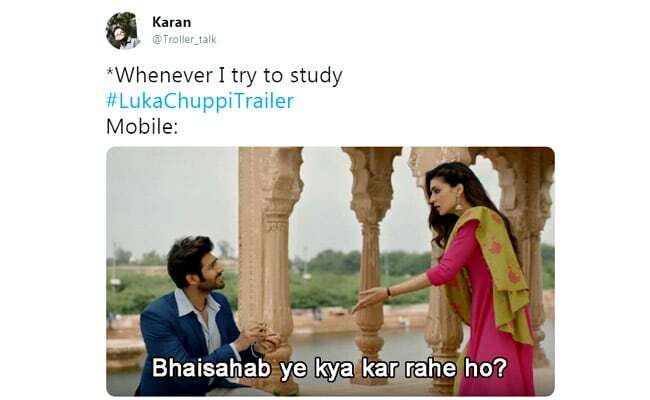 Here are the best memes from the Luka Chuppi trailer. The trailer of Laxman Utekar's Luka Chuppi hit the Internet on Thursday afternoon and the crazy love story of Guddu and Rashmi has already found a lot of cheerleaders. Starring Kartik Aaryan and Kriti Sanon in the lead roles, Luka Chuppi appears to be the story of the misadventures of a couple in a live-in relationship. And, given that the two-and-a-half minute trailer was filled with some meme-worthy moments, Twitter wasted no time in getting down to business. Here are some of the best memes that the Luka Chuppi trailer gifted us, compiled in one list. The memes have even been curated into a hilarious Twitter Moment. Shot extensively in Mathura and Gwalior, Luka Chuppi is set to hit the screens on March 1, 2019. You can watch the trailer here. This is not the only Bollywood meme to have gone viral recently. R Madhavan's transformation into ISRO scientist Nambi Narayanan for his upcoming movie Rocketry: The Nambi Effect also inspired a ton of memes.